Stanfield players visible left to right are Nathalie Cook, Alyssa Sobotta, Jessenia Carrillo, and Jami Erwert setting up in a defensive lineup against Ione on Saturday. 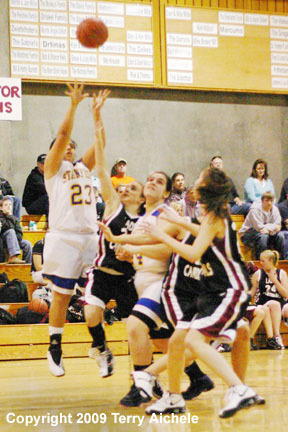 STANFIELD - The Stanfield Lady Tigers defeated Ione 47-33 on Saturday, January 3, 2009. After a long break due to bad weather and the holidays, Stanfield finally got a chance to take to the basketball court on Saturday. The teams started slowly in the first quarter with Stanfield leading 8-4 at the four minute mark. Ione then went on a run outscoring Stanfield 8 to 3 to take a 12-9 lead at the end of the first period. 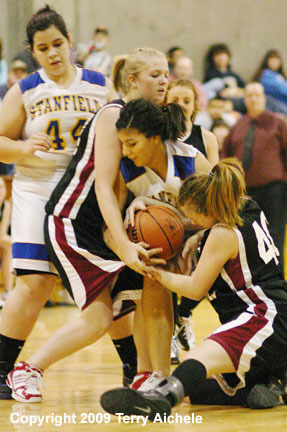 Stanfield held Ione scoreless for the first three minutes of the second period while scoring 8 points. Mikayla Baros helped ignite the Tigers by hitting two freethrows and hitting a layup. Jessenia Carrillo hit a couple shots to help stretch the Tiger lead. Stanfield lead at halftime 22-19. Ione's defense slowed the Tiger's scoring in the third period holding Stanfield to six points while scoring eight points. Jade Martinez scored on a layup at the 4:08 mark of the third. The Cardinals then held Stanfield scoreless for nearly five minutes to close within one point 27-28 at the end of the period. Stanfield came out fired up in the fourth period. Baros, Carrillo, Alyssa Sobotta combined for a 10 point run in the first four minutes of the fourth. Ione was held scoreless for the first seven minutes of the fourth. Makenna Ramos finally broke the scoreless slide for Ione with a freethrow with a minute to go in the game. 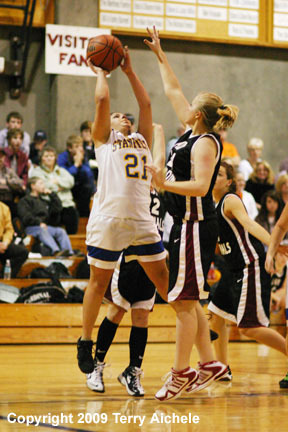 Stanfield commanded the game in the fourth scoring 19 points to Ione's six over the course of the final period. The Tigers showed strength and confidence in the 47-33 win. 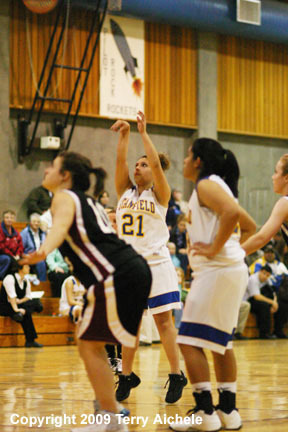 LEFT - Jessenia Carrillo of Stanfield shoots a jump shot early in the first period on Saturday. RIGHT - Mikayla Baros of Stanfield hits a freethrow during the first period of the game with Ione on Satruday. 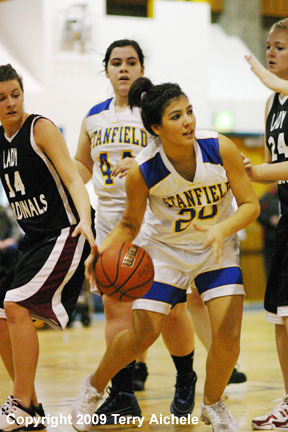 LEFT - Jade Martinez of Stanfield takes a shot during the game on Saturday. RIGHT - Tiger Alyssa Sobotta is swarmed by Ione defenders after a rebound during Saturday's game. 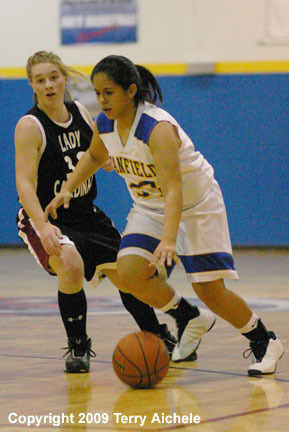 LEFT - Jessenia Carrillo of Stanfield makes her way around an Ione defender during the game on Saturday. 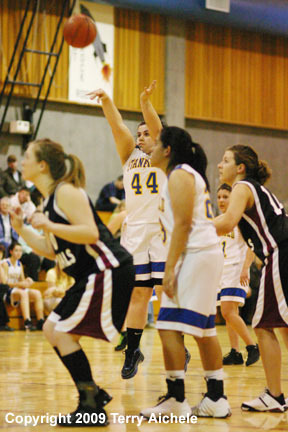 RIGHT - Jade Martinez attempts a freethrow during the second half of the game on Saturday.